If you’re reading this, welcome to Grimorio of Games‘ brand new website! We are a very little videogame development team formed by two people (currently), Javier Gilo (NJubei) and Víctor Pedreño (Hiboshi). Since we both met at high school we’ve been making games together. Some small projects, some bigger ones, but most of them were never released to the public (and only our friends played them :P). From 2013 to 2015 we both worked on Canvaleon, a stealth-based platformer videogame for Wii U. Javier was responsible of the character’s art and animations and UI design and Víctor worked as Game Designer and programmer (Canvaleon was made on a custom-tailored engine in C++). After Canvaleon, we took a sabbatical year in regards to game development. Víctor started teaching in a videogame course in Escola Pia de Catalunya, and Javier explored other professional fields. That brings us to the current situation. To make it clear: we LOVE videogames. And also we love making them. We feel a good game is made when the people making it is having a good time doing their job. So we felt we had to start anew, start little and go big, but step by step. And thus, Grimorio was born. At Grimorio of Games, we want to make games for passionate gamers as us. We want you to feel that the game you’re playing has been made by people like you. So our first game is going to be a retro metroidvania inspired by Dark Souls and with rogue-like elements. Just kidding, it’s going to be a good-old action platformer. Yeah, there are lots of platformers of all kinds, but we want to have fun doing it, so expect some nice things. The game’s name is Super Hyperactive Ninja. 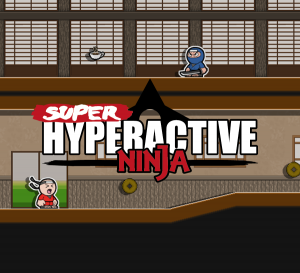 This is a remake of Hyperactive Ninja, an Android game developed by David León (Twitter) and Víctor while they were studying at Universitat Pompeu Fabra. David always felt Hyperactive Ninja could give place to more interesting game mechanics, and back then, when it was released (7 years ago! Time flies) there were plans to make a PC version with more complex controls. So we approached David with our shining game proposal for a Hyperactive Ninja remake, updated for console and PC controls (so our ninja would not run constantly, at least by default) and lots of new mechanics, and we got his blessing and support. We are developing Super Hyperactive Ninja in Game Maker Studio, and thanks to our friends at Jandusoft and Dolores Entertainment we will be able to bring it to PC, Playstation 4, Playstation Vita and Xbox One.